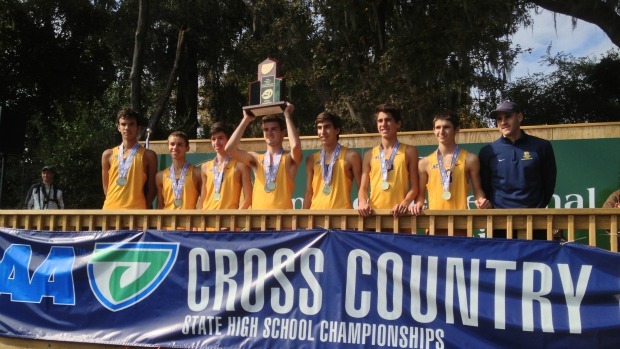 Flrunners is reaching out to interview and recognize all of the head coaches from the victorious cross country state championship teams to give them the opportunity to reflect and share their feelings and thoughts on their team's successful fall seasons culminating with state team titles. Coach Frankie Ruiz has guided Belen Jesuit to one of the most dominant boys programs in state history. The Wolverines have won six teams titles in the last seven years. How many years have you now been coaching? Eleven cool years as a head coach and five enjoyable observant years as an assistant coach. 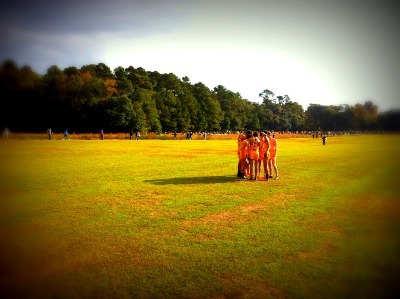 What advice did you give your team prior to the race or the week leading into the state meet? During the week leading into the state meet I encouraged my guys to focus on the details and to take nothing for granted. Every team on that starting line has an equal chance of winning and the best teams on paper still have to run the race to prove that right or wrong. I also reminded them to enjoy the moment and to take complete advantage of the opportunity because a high school running career is over before you know it and to trust me when I say it will be missed considerably if you don't maximize your chances at success. One more thing I stressed over and over was rest and overall attention to staying healthy. What was the race plan for the state meet and how did you feel it was executed? The race plan for the state meet was to run like we have been running every race which is to look for each other and keep the gaps tight. The course called for some adjustment to our team's running style, but the adjustments were minor so the familiarity was definitely there with our prior race strategies. Most importantly we were to focus on the tough sections of the course and work hardest to maintain and move up during those stretches. What were your feelings and emotions when you realized your team had won or during the awards? I always like to wait until the official results are posted despite what might seem like a win to the spectators. It also adds to my excitement and appreciation for the uniqueness of our sport. That anxiety and speculation mix are hard to replicate in any other sport. When the official results were posted online I felt relieved for the guys and of course a little for myself and the coaches. Then the relief moves into a feeling I like to describe as 'humbly proud'. I enjoy it for a while and even crack a smile of satisfaction for a bit, but then my brain goes back to work on how we could get better for the next race and the next season. I find that the feeling of being content doesn't last very long and I try to communicate that to my guys without sounding like I don't appreciate or recognize their successes. Instead I remind them that with the successful outcome of winning a state title comes greater responsibility and pressure to build on top of that success. The biggest challenges to the team are similar to what other teams experience in that they have to battle staying healthy, balancing school work and resting. Then of course the challenge of meeting or exceeding expectations, either self-imposed or by outside sources. 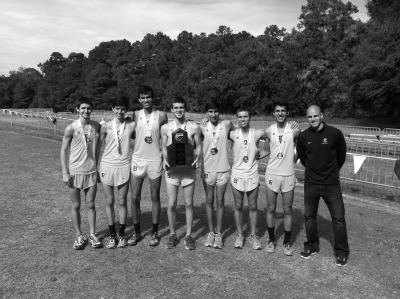 This year's team also had to make sure it filled the gap left by three top seniors of the 2011 team and overcoming that challenge began with their summer training as certain guys matured and gained some training age. What do you think were the keys for your teams to peak and perform their best at season's end? The main thing is that we don't look to peak, instead we want to run the entire season at about the same level so that at end of the season we aren't hoping that some magic peaking formula comes together at the perfect time. Towards the end of the season we try to fine tune ourselves physically and mentally, but never setting our sights on doing something we haven't done already or don't feel confident we can accomplish. What would you consider as the low point of the team's season? How was the team able to respond? The low point might have been our performance at Nike Regionals. I don't think that was our best performance, but I think the lessons learned will be very helpful going into track season and next year's cross country season. Even though it isn't our season's focus, it is still a meaningful race experience that we look to do well at and do our best to join other teams of Florida to represent with pride. I am blessed to have the opportunity to coach these guys. I don't think I thank them enough (or ever for that matter) for giving me a chance to be a part of their lives. Their passion for the sport and for achieving success is infectious and most certainly inspiring for me. They always look to improve and build upon each and every performance as well as on prior teams' accomplishments. The 2012 team can be described as a limitless driven and youthful (yet well-experienced) group of hard-working men. A crucial component of our program is the assistance of Victor Arrieta, Juan Rodriguez, Rene Medina and Carlos Barquin. These guys make up the best coaching staff a head coach can ever ask for. It sounds cliche but it is 110% true. I don't teach at the school so often times I have trouble making it from my business to practice and they are there ready to step in and I don't have to worry about how things are going. I am very grateful for their time, energy, and enthusiastic support they provide consistently year after year. They each have several strengths that contribute immensely to the overall program each season. I have had the great fortune of having their input every step of the way and making decisions is so much easier when you have a that. The team of runners really has a "team" of coaches leading and guiding them and that can't go unrecognized. What role do your parents have with the program? Parents are an important part and I think we have an incredible parent support system. They respect the coach's role and I respect their role. They show up in full force to cheer on their sons and they drive them to and from practices. It is hard to do it without them. Our parents also help out with our fundraising efforts for trips and improvements to our on-campus cross country course. One of the coolest things for me is to see parents of already graduated runners come back to support the team at races. When that occurs it is when you know you have a true program that has traversed just the running and made it to the family level. Thank you parents for doing what you do. My style is both instinctively and scientifically based. I try hard to learn from those around me along with the knowledge I have gathered from those that came before me such as Carlos Barquin. I hope to continue evolving and learning to avoid being that hard to change coach that is set on his ways no matter what. I find my style to be balanced between quality and quantity while taking into account the training age of the current year's team. Every day I try and learn something new to apply to my career as a coach. I hope that along the way I can give back some of the accumulated information and experience to help my runners and fellow coaches of the sport in their pursuit of success. Ultimately I hope my coaching style always focuses on making better men rather than just better runners. I try not to designate any one leader and this year was no different as we had a sort of leadership by committee as we often do. Some of the best leadership this year came from outside of the final top seven in part due to the fact that we only had one senior that was in the top seven. I think Avery definitely led his team on the course and he was well supported off of the cross country course by six deeply committed seniors. There is no doubt that having leaders on the team is part of the formula for success and I felt that this year's team had a nice mix of leaders, some of which were juniors, who provided inspiration and direction using their respective talents and strengths. Next year's team will most certainly have a strong field of seniors and I am looking forward to the level of leadership that will come with that. The season had several runners who stepped up their contribution level but I think two that stand out are junior Andy Fernandez and sophomore Ryan Rodriguez. These guys had incredible consistency and significant improvement from 2011 to 2012. Ryan dropped over a minute and a half to bring himself into the 15's and Andy knocked nearly a minute to drop him into the near 16 mark. These kinds of guys make the younger guys believe in the program and understand the value of hard work and relentless discipline. I expect next year's team to pick up where the 2012 team left off. The specific expectations will be set by themselves during the summer, however, as a coach I will encourage them to build on prior team's accomplishments and pay attention to only their own goals. With a solid track season and a strong summer they can position themselves to have another successful season.